NCover 3 navigation was primarily via the tree view, the source code window and various menus of the Explorer interface. NCover Code Central offers several more intuitive ways to manage, view and drill-through your coverage data. The "breadcrumb" hierarchy at the top of the Explorer shows where you are in the coverage data -- by Project, Execution, Module/Document, Namespace, and Method -- and allows you to easily move back up as many levels as you like. In the bottom panel, the Coverage Navigator also shows you what level of coverage you're viewing, along with what specific Modules, Documents, Namespaces, Assemblies or Methods are currently loaded. 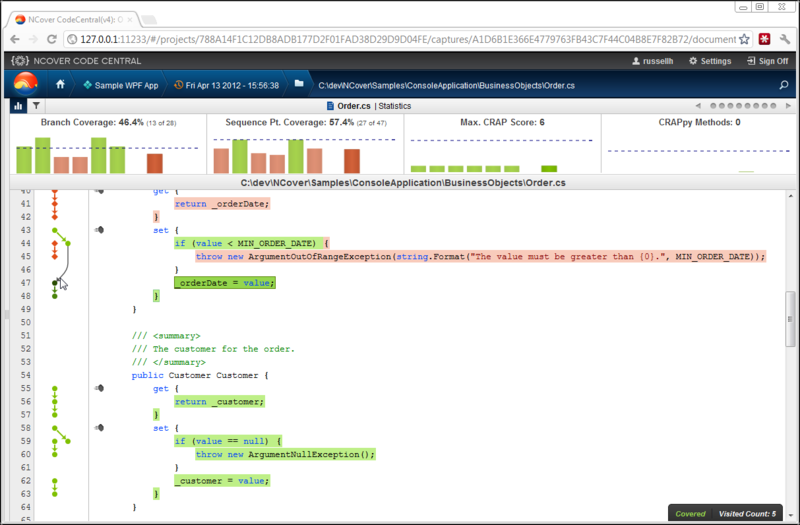 Besides your location, the Navigator also displays a customizable summary of all available code coverage metrics on each line (see Column Display below). All NCover products run by default in HTML5-enabled browsers, so you can navigate through and bookmark Code Central pages as you would in any web application. After selecting a Project on the Home page, click to display the Execution view. 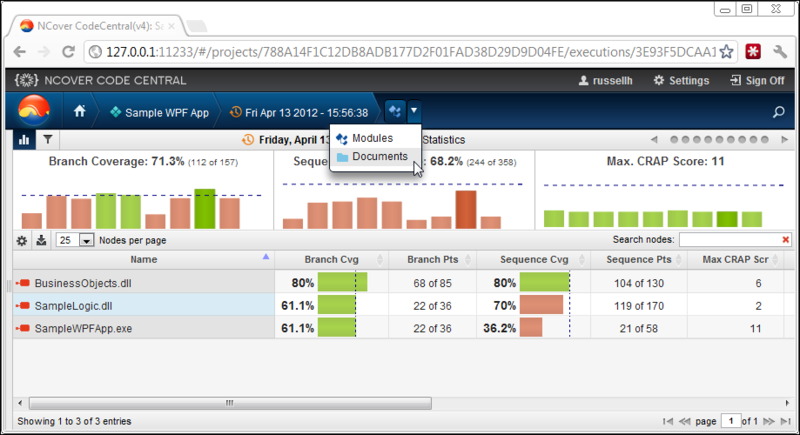 click on an Execution to drill down to the next view, which defaults to Modules, with Documents also available. In the lower right corner of the Source Code window, the coverage status is indicated by simple red or green text coloring of the word "Covered" in a pop-up window, activated by mousing over lines of code. Code Central will also alert you with a toast pop-up notification at the top of the Explorer window when new coverage data is available.